Whenever you ask a young child what they want to be when they grow up you get the typical answers like firefighter, teacher or a policeman. However, once in a while you come across that one child that says “I want to be a singer!” or “I want to dance when I’m older!” People tend to discourage the idea of a child being a part of the arts because of money, and it is a difficult industry to be successful in. Most times people would not take a small child seriously and would just believe they would grow out of the idea of being “famous” one day. When a teenager comes up to someone and says he or she want to be in the arts for a living then people begin to worry. They have justifiable reasons to be worried; however, when a child reaches a certain age, they have to be able to let go and allow them to live. 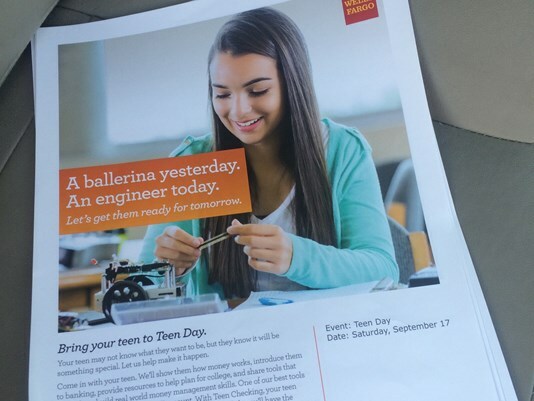 A pamphlet published by Wells Fargo Bank showing a girl who gave up her passion of dance for a “better hobby” as an engineer. The pamphlets have been discontinued and Wells Fargo has apologized for any negative effects the pamphlets may have had. Business in the arts is tough there is no denying that. The people in the business usually do not remain there, money is tough to come by and most people who want to be successful in that industry, do not even make it in. However, there is no reason to discourage children who have this dream and say that they will not be able to do that. Maybe we do not want to instill in their head that it is absolutely happening but there is no reason to crush dreams. There is also no reason to make a child give up what they love because you do not believe it is a good idea for them. A girl can be a ballerina and a math genius and a young man can be a singer and an engineer. There are ways for children to do both but the bottom line is jobs in the arts like acting, singing, dancing and theater are all valid jobs. Just because someone needs to work that much harder for a job and be challenged by society does not mean the job does not exist. It simply means that someone has to be very dedicated to their work and determined to make their dream happen for them. That is the key to realizing that jobs like these are truly jobs in society, knowing that the people themselves have to make it all happen for them. It is not anyone else’s responsibility to get people their jobs in the business other then those people. If that is their dream then they have to make that happen. However, we all have to understand that going after a job like that is their decision and success is in their hands. There is no reason for everyone else to stand around and judge them for their decisions. Chocolate Milk: Essential After Exercise?